Penny Arcade’s PAX conventions need no introduction. Established way back in 2004, the well-known gaming convention is held in four locations across the States and one in Australia: Melbourne (was nearly named Batmania!). 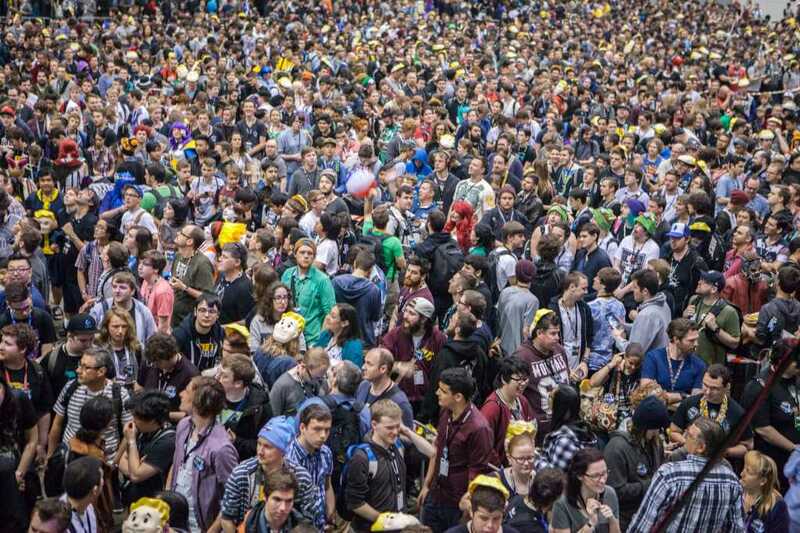 PAX AUS will run from October 27th to 29th at the Melbourne Convention and Exhibition Centre, and features a packed exhibit hall, panels, nightly concerts, tournaments, opportunities to play new games and something called the Omegathon. Yeah, me neither. The Omegathon is a “mega-tournament” that spans the entire length of the convention, featuring games and platforms across all genres. The tournament starts with 20 players or “Omeganauts” and players are eliminated during each round until the last two compete in the Final Round. This year’s games will be (in order) Overcooked, Crawl, Sushi Go, Arms and, saving the best until last, Ms. Pac Man. Opportunities to play games abound across multiple genres and platforms, including PC games, tabletop games, virtual reality games, console games and indie titles, handpicked and showcased in PAX Rising. Developed by smaller teams, PAX state that they “believe these titles have a chance to rise above their modest beginnings, by growing as a company, establishing a fan base or pushing the industry”. The PAX AUS indie showcase brings attendees even more access to the best that the Australian and New Zealand indie scene has to offer today. Titles are chosen by industry vets and given booth space on the show floor. This year, titles include Grabity, described as a “physics-based arena brawler” and The Gardens Between, an “adventure puzzle game” that “tells an evocative story about what it means to grow up, what must be let go what should never be left behind”. Broadcast live, via Twitch, to thousands of viewers worldwide, the PAX Arena offers the chance to watch some of the most “talented, brutal and merciless” eSports athletes compete from around the globe. PAX Arena runs throughout the weekend; programming varies from beloved classics to the trendiest new games and everything in between. Burnie Burns, Rooster Teeth co-founder and creator of Red vs. Blue, will deliver the “Storytime” opening keynote. Burns’ full body of work also includes 2015 sci-fi comedy Lazer Team and The Sims parody series The Strangerhood. Other interesting panels include: Online Down Under: Turning YouTube and Twitch Into a Full-Time Job, in which some of Australia’s biggest gaming YouTubers and Twitch streamers will discuss the Aussie perspective on content creation; Games are for Everyone: The Accessibility Panel, a discussion about issues of gender, race and body diversity in making gaming accessible for everyone; and Pax Pirata: Censorship in Gaming, Media and Society, a discussion about censorship in the gaming industry. And lastly, attendees at PAX AUS with a penchant for collecting can get involved with pin trading through Pinny Arcade, an ecosystem of collectable pins which can be traded with other attendees, enforcers and staff during the weekend. Check out the Official PAX Merchandise Booth on the show floor to get your collection started.